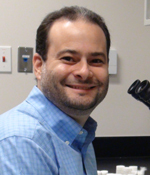 Joshua M. Shulman MD, PhD is Principal Investigator of the Laboratory for Integrative Functional Genomics. He is Associate Professor in the Departments of Neurology, Neuroscience, and Molecular and Human Genetics at Baylor College of Medicine and an Investigator in the Jan and Dan Duncan Neurologic Research Institute at Texas Children's Hospital. Dr. Shulman received an A.B. in Biochemical Sciences from Harvard College, and his Ph.D. in Genetics from Cambridge University. He subsequently studied at Harvard Medical School and the Massachusetts Institute of Technology, Division of Health Sciences and Technology, where he received his M.D. and later, an M.M.Sc. in Clinical Investigation. Dr. Shulman completed his clinical residency and fellowship training in the Harvard/Partners Neurology Program at the Brigham & Women's Hospital and the Massachusetts General Hospital in Boston. Before joining the faculty of Baylor College of Medicine, Dr. Shulman was an Assistant Professor of Neurology at Harvard Medical School and an Associate Neurologist at the Brigham and Women's Hospital. Among his honors, Dr. Shulman has received a Career Award for Medical Scientists from the Burroughs Wellcome Fund, the C.W. Cotterman Award from the American Society of Human Genetics, and the American Neurological Association-Grass Foundation Award in Neuroscience. He is a member of the American Academy of Neurology, the Movement Disorders Society, the Parkinson's Study Group, and the American Society of Human Genetics. Besides directing the Laboratory, Dr. Shulman sees patients with Parkinson's disease and related conditions in the Baylor Parkinson's Disease Center and Movement Disorders Clinic.